As discussed in other areas of this website, grilling pork is something that takes your full attention. Why is that? Because today's varieties of domestic pork are much leaner than this of decades ago, with very little marbling. From a health standpoint, less fat is better. From a BBQ or grilling standpoint, it makes very easy to over cook, ending up with a piece of meat that resembles the texture of a tennis shoe. There are a few things to focus on when grilling pork. Call Your Butcher: Tell him or her to cut you a bone-in chop to 1 1/2 inches thick. Preheat Your Grill to Maximum Temperature and Clean the Grate: This will prevent sticking and encourage a searing of the meat. Allow the Chops to Warm to Room Temperature: People forget about this, but it's very important and speeds up the cooking process. Don't let them stand at room temperature for longer then 20 to 30 minutes before grilling. Use a Good Rub: Rubs not only add flavor, but they also add texture and a crispiness. 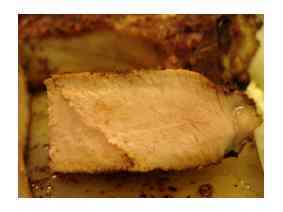 DO NOT OVERCOOK: Stay with the meat to watch for flame ups, which happens a lot with pork, especially on a gas grill. Turn the chops frequently. Use a thermometer to check internal temperature, which is done at 160 degrees Fahrenheit. Let the Chops Rest: When grilling at a high temperature, the juices retreat to the center of the meat and are very active. give them five minutes to allow the juices to redistribute through the meat before serving. Leave Grilling Pork and Return to BBQMyWay Homepage.